Vaar langs de kust van Manuel Antonio National Park op deze tour vanuit Quepos. 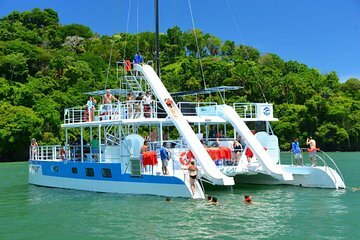 Aan boord van een catamaran, cruise je naar snorkel- en zwemplekken in Bahia Biezans voor de kans om het onderwaterleven in hun eigen omgeving te spotten. De lunch is inclusief flan, vers fruit, cocktails, vruchtendranken en Costa Ricaanse koffie. Great team leading the sailing with extensive knowledge of the area. The day was beauriful as we sailed on the Pacific. The crew was great! I would recommend that the crew sits in a more visable location as they were very hard to find undercover in the garage. The word canopy means garage in Costa Rica and not knowing this we were looking under many of the tent vendors set up along the walk from the pier to the garage. The sail was fantastic, merky water so the snorkeling was not good. I suggest they scrub down the last 4 steps on the boat as the slime caused me to enter the water faster than planned.